Come experience our restaurant in Cape May, NJ and enjoy wonderful dishes in a fun and friendly environment. View our awards and accolades below. Awarded to the top 10 U.S. inns that offer the best on-site dining in addition to luxurious accommodations. Read more. 2015 TripAdvisor Certificate of Excellence - 5 years in a row! The Mad Batter Restaurant was voted Great For Outdoor Dining, Best Contemporary American Cuisine, and Most Booked Restaurant. 2018Best Brunch – 11years running! 2018Best Happy Hour - 6 years in a row! Best of Cape May 2018 "Best Brunch," "Best Happy Hour,'" "Best Place to Hear Live Music,"
Best of Cape May 2017, "Best Brunch," "Best Happy Hour,'" "Best Venue for Live Music," "Best Bar for Craft Beer, " "Best Mocktail"
In 2015, the Star Ledger’s iconic food critic Pete Genovese named the Mad Batter as a semi-finalist in his J. 's Best Bars showdown. Best of Cape May 2016, "Best Brunch," "Best Happy Hour," "Best Venue for Live Music," "Best Children's Menu"
La Vinci Productions tagged The Mad Batter Restaurant and Bar At The Carroll Villa Hotel in a video. Mad Batter's been offering Cape May better breakfasts for 35 years. Cape May Star and Wave, June 8, 2011. Vets Remember Battle of the Buldge. Shore News Today. December 29, 2010. Green gingerbread a hard sell. The Press of Atlantic City. December 20, 2010. Carroll Villa Provide Free Rooms to Veterans. Cape May County Herald. November 11, 2010. Featured in Cape class helps students become brewmeisters. - Press of Atlantic City, January 18, 2010. Featured in Solar panels OK in Cape, just hide them. - Press of Atlantic City, December 20, 2009. Mentioned in What's hot at the BEACH? The Patriot News, July 2, 2009. 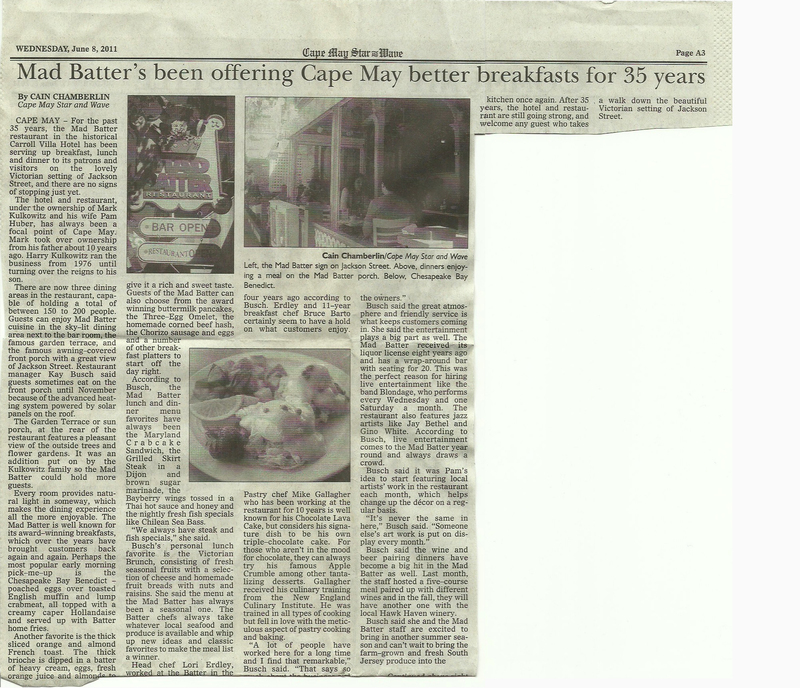 Featured in Batter Up: Cape May restaurant serves up fun & style - indulge, May 15, 2009. Mentioned in Cape Cuisine: Cape May has dining options abound - Celebrate Spring in Cape May County, April 19, 2009. "Thick-sliced orange and almond French toast and award-winning buttermilk pancakes give the Mad Batter the best breakfast in this ﬁne dining town. Art exhibits, live music, and a lively happy hour complement the cuisine. Enjoy it all from the porch overlooking Cape May’s historic Jackson Street." News Flash, Cape May, NJ! The Mad Batter Strikes Again! BED AND BREAKFAST "GOES GREEN"